Breathing that is relaxed and functional does not over-involve shoulder muscles. On the other hand, breathing that is dysfunctional often includes an excessive amount of up and down shoulder movement. A lifetime of dysfunctional breathing can change the pattern of movement of the shoulder complex resulting in shoulder or scapula dyskinesis. While it makes sense to evaluate breathing in people with shoulder problems this often does not happen because manual therapy practitioners lack the tools or standardised protocols to evaluate breathing. The Manual Assessment of Respiratory Motion (MARM) and Self Evaluation of Breathing Questionnaire (SEBQ) are two tools I developed and validated in my research. It’s great to see them being used in this research study investigating the relationship between breathing pattern disorders and shoulder dyskinesis. 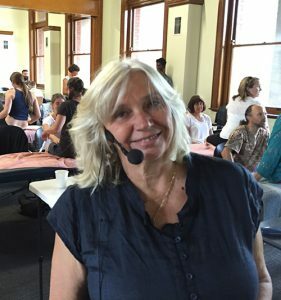 I teach these breathing assessment techniques in the Integrative Breathing Practitioner courses and will also be teaching them in the hands on course I’m teaching in Chicago this September. Email me at contact@rosalbacourtney.com if you would like more information about these techniques.